Returning to where this blog left at the beginning of last week, we are back in the city of Glendora, California where we captured another monumental structure, the First Christian Church. As the title of this post implies, on the surface the church building is a monument to the Christian Deity, however, I submit that it is really a monument to the people who founded this church. 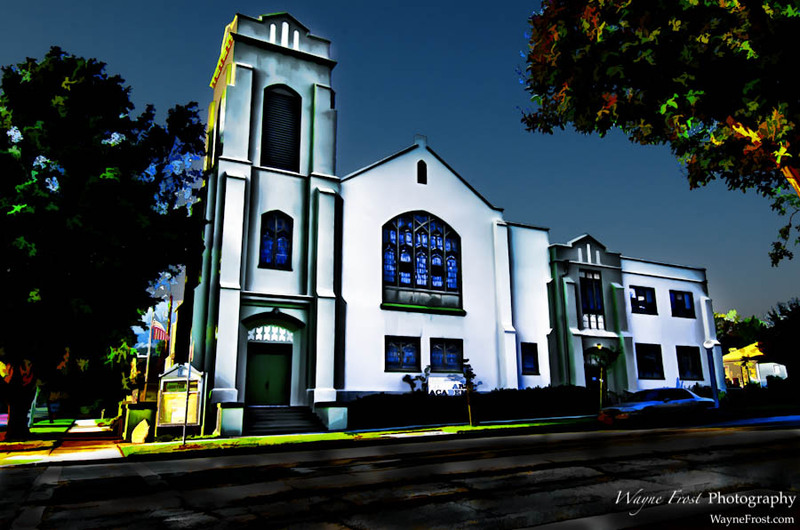 Those who organized and brought the first congregants together, who raised the funding and navigated through the process of building and furnishing the structure. Given that Christian religions see God as a manifestation of Man, I have to draw the conclusion that while church building’s may serve to celebrate, revere and worship their related Deities, the buildings themselves really serve as a monument to those persons who have successfully promoted the philosophical values embraced by their peer leaders. The people founded, nurtured and sustained the church, not some mystic Deity. I am intrigued by the dark tones of the windows and other structural elements against the stark whiteness of the concrete structure, it really leaves me with a feeling of severity. Kind of like the severity of a religious zealot obsessed with punishing those who might transgress the moral standards of the zealot. Please click the image to view in high resolution.